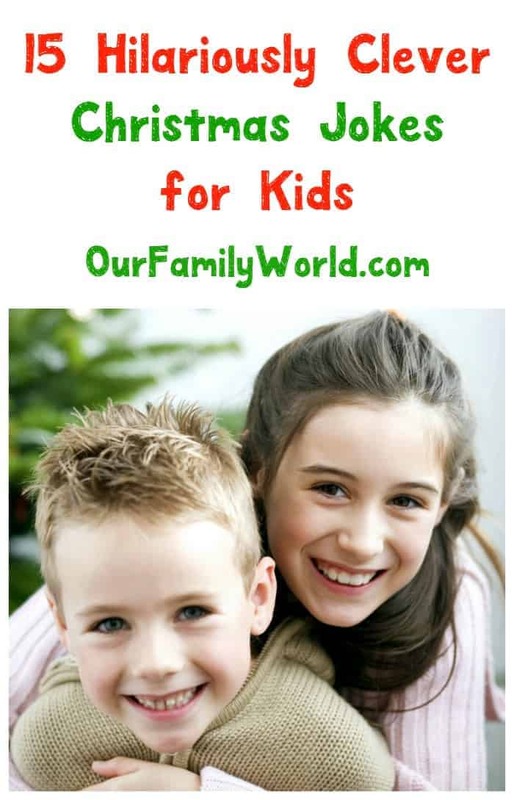 Do your kids love telling jokes and riddles as much as mine do? I’ve been gathering up all the funniest Christmas jokes for kids that will have your whole family rolling on the floor laughing! They’re perfect for sharing in humorous handmade holiday cards, breaking the ice at Christmas parties or just for when your little ones need a giggle after a long day at school. Check them out, then tell us your favorite Christmas jokes! Q. 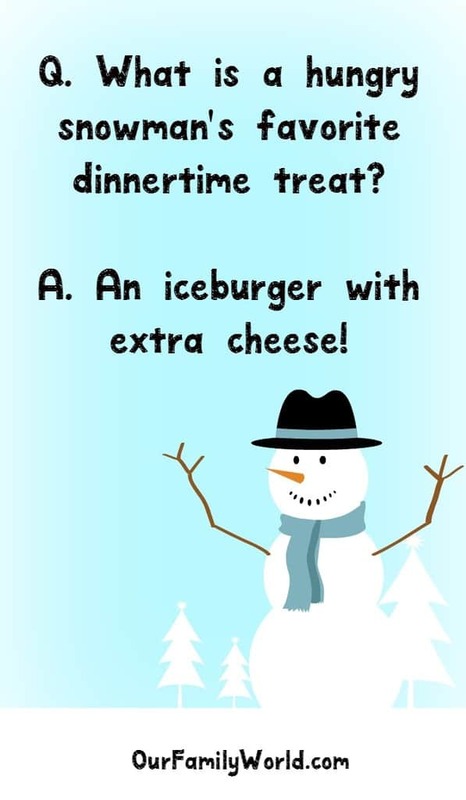 What is a hungry snowman’s favorite dinnertime treat? A. An iceburger with extra cheese! Q. What song do Santa’s elves sing to him on his birthday? A. Freeze a Jolly Good Fellow! Q. Why can’t a pine tree knit an ugly Christmas sweater? A. It keeps dropping the knitting needles! Q. What does Mrs. Claus tell Santa when it’s cloudy out? A. It looks like rain, dear. Q. What does a gingerbread man need to make his bed? Q. What does your dog get when he eats holiday decorations? Q. How does Santa take pictures, without a cell phone? A. With a North Pole-aroid! Q. What’s the best thing to put in Christmas cookies? Q. Santa’s taking a nap. What do you call him? Q. Why is it always so cold at Christmas? Q. Knock… knock. Who’s there? Anna. Anna who? A. Anna partridge in a pear tree! Q. Which Christmas candle burns longer, red or green? A. Neither one. Candles always burn shorter. Q. What did one snowman ask his snowfriend? A. Hey! Do you smell carrots? Q. Why does Santa Claus help Mrs. Claus tend to all three of her gardens? A. So he can Ho-Ho-Ho! Q. What Christmas carol does Tarzan love to sing? These Christmas jokes for kids aren’t just for telling at holiday parties. You can also add them to gift tags or make them into fun and festive lunchbox notes. Last but not least, keep this in mind, every day is a good day to tell a joke and spread some cheer. Do you have any favorite Christmas jokes for kids? Share in the comments! Ooh I can’t wait to tell my nieces these jokes this weekend! They are going to get a big kick out of them. Hilarious jokes, enough to make you laugh and get excited about Christmas! I love this, it’s a great way to make you spread the good vibes! Haha! These are some original and “never heard” jokes. Kid’s jokes are always awesome. Christmas is so much fun all around and these kids jokes could add more fun to the festival. I love that funny Christmas video as well! Hahaha, I love your post. This is so lovely and perfect for the kids this Christmas. My daughter loves jokes! I can’t wait to tell her these ones. These are so cute! I love these! Always nice to make the holidays fun. OH those slay me…or should I say ‘sleigh’ me? The kid jokes are always my favorite. I remember singing all kinds of crazy songs for the holidays. A lot of them became big jokes. It’s great to see the tradition continue.